i am becoming a little more asian everyday! i'm proud of the way i have been able to adapt to all of the korean food. the first few times i tried it in the states, i was legitimately concerned about how i would make it a whole year here. but once i got here, i magically developed a taste for it and am getting to the point where i can really begin to enjoy it. today we went out to eat bibimbap for lunch and i slammed it down like a pro. we're talking clean plate club here, folks. some of the other teachers are still a little wary of the food...as i had expected to be. but i am slowly but surely acquiring a taste for it. bibimbap is a really popular korean dish and is basically rice topped with all kinds of vegetables, seasoned meat, spicy pepper paste, and often times, an egg. it comes out looking beautiful, and you mix it all together before you eat it. the first time i tried it, i was not a big fan but i chowed it today...so good! for dinner tonight, john and i shared some gimbap and omurice. we killed it. everyone is amazed at how much we eat...hahaha. 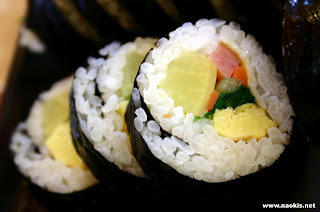 gimbap resembles a sushi roll...rice, vegetables, egg, and a protein wrapped up in seaweed. we had the ham variety and it was so good. 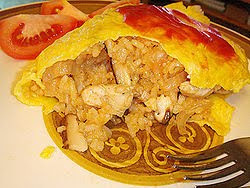 omurice is essentially an omelette stuffed with fried rice and covered in a sweeter sauce. it sounds so strange to a westerner but it is so delicious. again - we were clean platers! i am slowly but surely learning korean phrases. with the gracious korean hospitality, we are using 'kamsahamnida' or 감사합니다 very often. this means: thank you! everyone here is so nice, so its a very necessary thing to learn. tonight while shopping at home plus, i said my longest korean phrase thus far: hangukmal mot haeyo. or 'i can't speak korean.' hahaha. i picked it up a long time ago from a podcast and was saving it for a rainy day. it seemed to help the cashier really understand that i wasn't stupid, i just didn't know the language. she said 'ahh!' and just smiled at me. and while on the home plus topic, i'll just add that walmart and target have nothing on the korean shops. we're talking like 5 floors...megastores! they are seriously overwhelming, but awesome all at once. one of the other teachers, david, is an NNU grad who just came back to korea for a 2nd year. he was here then took a break to go back to the states. it's great to have him here since he knows the ropes and is super helpful. 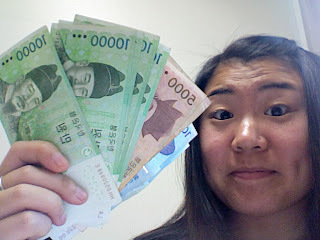 he took me to the bank today to exchange my u.s. dollars for korean won. i felt so rich! the current exchange rate is approx 1000 won = 86 cents...awesome! in conclusion, i learned alot in today's orientation about the city of cheonan and the program we are working with here. but to sum it up, i will say that americans are shamefully lazy, and koreans put us to shame when it comes to taking initiative on the educational front. many korean students will attend a normal school day from 8a-3p before they go to another academy in the afternoon. some attend school til 10 or 11 at night. the thirst for knowledge and education is unbelievable here. i also learned that the program here between KNU & the city school district is really something special and unique. and it kind of blows my mind to think that my friends and i have the chance to be involved in an opportunity like this. it is of great significance that KNU was chosen by the district to be trusted with such a big task as recruiting english teachers for the entire district, as it is only one of many universities here...and a small one at that! it is also amazing to think of how all of our schedules have coordinated to allow us to be here to serve together this year. this is an opportunity i choose to make the most of & not to take for granted. i guess you could say that i got a glimpse at how big God is. i can't dwell on it too much because it starts to hurt my brain...seriously mind blowing! bedtime here as most of you are just waking up in the states. i hope you all have a wednesday that is as great as the one i have just completed!